Combining Einstein's theory of relativity with one of the most powerful telescopes in the world has helped an international team of researchers measure where and how dark matter structures grow in the universe. Their analysis suggests cosmic structures might be evolving more slowly than previously predicted. A team led by the Kavli Institute for the Physics and Mathematics of the Universe constructed a map of dark matter throughout the history of the universe by analysing images of more than ten million galaxies. The results appear to challenge current understanding of the fundamental laws of physics. "If further data shows we're definitely right, then it suggests something is missing from our current understanding of the Standard Model and the general theory of relativity," says physicist Chiaki Hikage. According to Einstein's general theory of relativity, gravity warps space and time. To date, this theory has successfully predicted the expansion of the universe, the existence of black holes, and the bending of light from distant stellar objects. If cosmologists confirm that the observed universe is evolving more slowly than the theory predicts, it would mean an entire branch of physics has not yet been discovered. Dark matter is responsible for the formation of galaxies, and dark energy is responsible for accelerating the ongoing expansion of the universe. Together, they make up 95 percent of the universe. Mapping the density of dark matter in today's universe and reconstructing historical maps of dark matter going back 13 billion years could help study changes in dark matter over time. Such a comparison could also elucidate how dark energy has influenced dark matter's growth in the universe. Dark matter is not visible, but its effects can be seen on the shape of galaxies. Since the gravity of all matter, including invisible dark matter, bends the path of light, far away galaxies appear distorted to observers on Earth. Researchers can calculate how the dark matter is distributed in the universe through the distortions of galaxies. 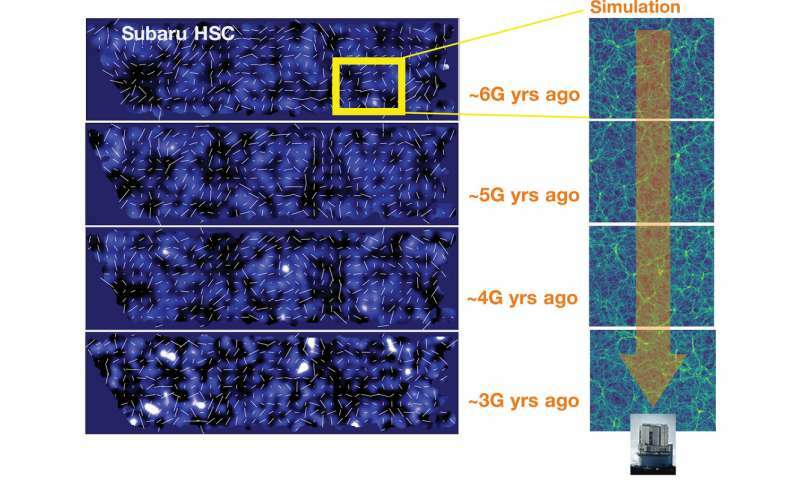 Hikage and his team analysed images of ten million galaxies from the Hyper Suprime-Cam (HSC) Survey. This 870 megapixel camera, attached to the 8.2 metre Subaru telescope at the summit of Maunakea, Hawaii, surveys the sky, drawing a detailed map of the universe. It is enabling researchers to study galaxies billions of light years from Earth. These galaxies existed billions of years ago, but their light is only reaching Earth today, making it possible for researchers to study the universe from its infancy. 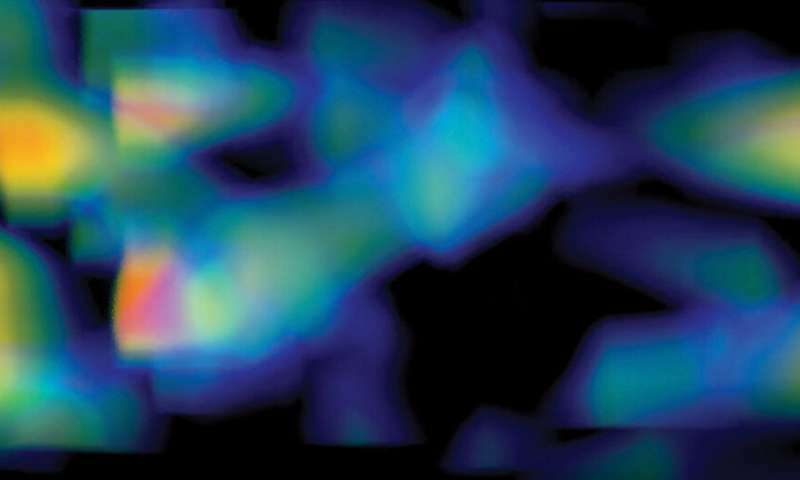 Using the information from these images, the researchers were able to make the most detailed three-dimensional map of dark matter in the universe to date. The map was consistent with past studies. However, it also suggests cosmic structures might be evolving more slowly than predicted by other research teams. Hikage explains that more data is needed. "With a little more work, if we can get better accuracy, we might be able to find something concrete. This is a big motivating factor for me." The researchers will continue to analyse more HSC Survey data, bringing them closer to discovering whether science needs to rewrite its rules about the universe.
. If cosmologists confirm that the observed universe is evolving more slowly than the theory predicts, it would mean an entire branch of physics has not yet been discovered. We'll call it dark something or other. Couldn't possibly be that the standard guesswork is wrong. Better yet, we can stop doing science and chalk everything up to electricity and plasmoids. "Better yet, we can stop doing science "
When you say "we" I know you don't mean you....LMAO...what is that little equation you have to show the pressure based heating of matter in the Corona again? What is that relationship again? Between pressure and temperature...in the corona? I hope you still have me on ignore Kittykat....two days in a row of you exposing your level of understanding and literacy could land you in an asylum. In the Bullet Cluster collision the dark matter has not separated from the ordinary matter. The collision is analogous to two boats that collide, the boats slow down and their bow waves continue to propagate. The water has not separated from the boats, the bow waves have. In the Bullet Cluster collision the galaxy's dark matter displacement waves have separated from the colliding galaxies, causing the light to lense. Seems like the standard theory is getting rickety. How much more can be glommed onto it before it collapses? with a mathematically sustained theory? That results in a working non-nuclear reaction to the same scale of fission-fusion energy as SR/GR/QM Theories? Then maybe you wooloons could gain some professional attention? Besides the Mental Health specialists. Right now? None of you have any credibility because you are incapable of inventing any working device that proves your claims. While using the very technology, computers, cell phones, internet, video-game controllers based on the scientific research you deny & disparage as inferior to your fabulist vaporware. Please point to the working devices that are due to GR or SR. Good luck! GPS satellites. Nuclear weapons. Television. Radar guns. Satellite TV. Due to? WTF? If, however, you fail to take account of those, then your GPS is useless. GPS satellites may or may not use GR, but it is not necessary. The rest of your examples, not even close. GPS satellites may or may not use GR, but it is not necessary. Yes it is. As proven decades ago. Stop lying. If one reads the accepted paper [ https://arxiv.org...9148.pdf , https://www.scien...rd-model ] it is easy to see that the press release is playing up what is not in their paper. Re: " it suggests something is missing from our current understanding". The paper itself tests the LCDM well and find no significant tension. On the contrary with all the data it gets constant dark energy as best model and it lowers LCDM uncertainties - it agrees with the Planck Hubble parameter and lowers the significance in the tension against the local supernova Hubble estimate. The earlier slight DES deviation of slow structure growth [ https://www.scien...k-matter ] is neither improved nor decreased. In other words, the usual LCDM win that we are so used to read with most every new cosmological data survey. To sum up the result, to no one's surprise this result goes against the expected trolls. They were too lazy to retrieve the paper and read it. And their seriously flawed comments speak for them. Actually modern field theory, electronics, optics, and chemistry has a century of SR. You cannot understand these areas on modern levels if you do not include it. For a simple example, magnetism is an SR effect (though classically they did not know that), so old fashioned relays are due to SR.
Well cant, I cant offer anymore of a reply to your cant. Than the sane commentators have already replied to your gibberish. Until the middle of the night. When I will suddenly wake-up, yelling "Stochastic Evolution!" Uh, fellows? Please do not blow uo my city. Appreciate your interest in the subject but I'd as soon do without. Thanks guys. Another thing I'd as soon do without? cant round up your cliche clown posse of frauds & remove yourselves from the premises. The stench of woolunacy is a miasma of poor mental hygiene. I just had a wonderment. There do seem to be a steady stream of fulsome flaring from smaller than Sol-mass stars? Is this because they are more available for observation? Or. perhaps observed more often than Sol-type stars? Or. are there possibly other reasons for the apparent abundance of small sub-Sol dwarf star flaring so much? Are the smaller stars lacking the mass to stabilize their energy output? For instance, if a sub-par star goes through not-so-subtle cycles of building up excess energy, releasing as a flare? Then going through an exhausted period to recuperate before flaring again.? lack the gravity-well to retain the material & energy vomited? GPS satellites use a modified form of GR, so not strictly GR.